The Toyota Camry is the midsize sedan that has drivers excited this year. Part of that excitement has to do with all the safety features in the Camry. Take the Camry out on the highway and activate the Dynamic Radar Cruise Control, then watch how this feature protects you. Once the speed is set, the radar is scanning the road to ensure that safe distance between you and the car ahead is maintained. If not, your car is slowed until clear, then the speed resumed. 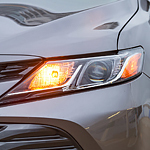 After dark, the Automatic High Beams feature in the Toyota Camry is activated. These high beams help the driver to see further, and they toggle to low beam if another car is coming towards you. Once clear, the low beams switch to high beams on their own. The Toyota Camry is going to impress you, so visit Lithia Toyota of Missoula and take one for a test drive.